I feel like I had kind of my last Summer weekend. Labor Day a little bit has that “Sunday Dread” thing going on doesn’t it? So Ok, I guess it is official. It’s the last week of Summer. Once we get through Labor Day weekend the kids go back to school and we all spend a few weeks trying to settle into our new normal. Both kids are in school this year and that will mean a lot of changes for them and also (majorly!) for me. But don’t worry- we have one more week left to milk summer and I am going to make sure that a few last summer recipes makes an appearance before we start getting all crazy around here with soup and pumpkins and stuff. Do any of you have requests before Labor Day weekend? Do you need a recipe roundup or something special for your weekend BBQ? Please let me know. 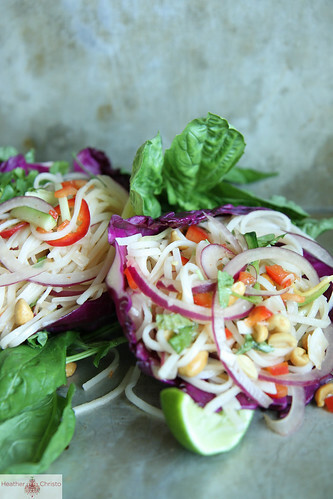 In the mean time you have this incredibly fresh and delicious Thai Noodle Salad. While this is by no means summer exclusive, it is packed with fresh garden vegetables and flavored with basil grown in my back yard. 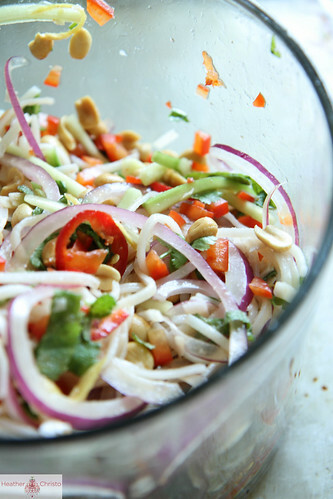 It is a cold noodle salad made with bright vibrant flavors and it makes an awesome side dish. Or I love it all on its own for a light dinner or perfect lunch. Enjoy! In a large bowl, combine the ingredients for the Thai Dressing and stir them together until they are well mixed. Then add the rice noodles and all of the vegetables. Gently toss until well combined. Spoon the salad into the cabbage leaves and garnish with the fresh basil and lime wedges. A perfect salad to end summer! Let’s hold on it as long as possible! Looks so yummy. I would love this all on its own. Love the flavours in here and I liked that you served it in cabbage leaves! 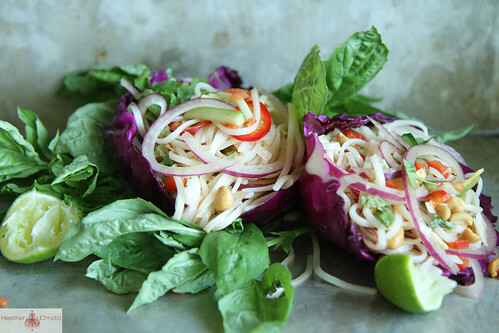 Love the colors and Thai flavors of your salad! This not only looks gorgeous but love the flavors and perfectly healthy too. This salad looks so fresh and colourful! Love! 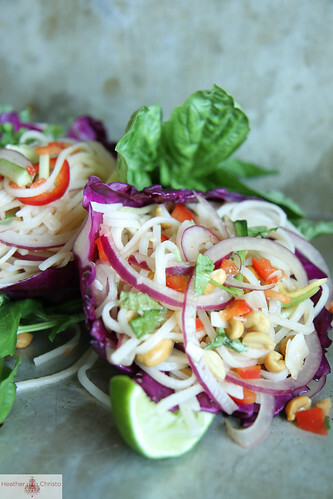 I am in love with this thai noodle salad! So colorful and delicious!! What an interesting mix of flavors in that dressing; I have to try it. I love how colorful your salads are! As far as requests, I have always wanted to ask a professional chef this. I love to chop vegetables, but don’t have a mandoline or any special tools, and I’m very slow, which discourages me from making some things which I know I would enjoy. I wonder if you’d be willing to do a sort of tutorial or hints about how to dice, slice, chop, or just what you use to make things easier in the kitchen. Is this something you had to learn over time and it just gets easier with practice, like most things? Or are there ways to make things more efficient? I’m not really talking about rushing so much as just making things simpler and prettier. Thanks so much! That dressing sounds absolutely scrumptious! Such a fresh & healthy lunch! This is a beautiful salad! I’m wondering if the dressing would work without the brown sugar? I’m not able to eat sugar… would a drop or two of stevia work? Absolutely Alexandra!! Let me know how you like it with the stevia! This salad looks beautiful. Love that you serve it in a cabbage leaf. Can you tell me what coconut cream is? is coconut cream the same as coconut milk or can you use coconut milk in place of coconut cream or maybe simmer the coconut milk to make it as a thicker cream? The coconut cream is the thick stuff at the top of the can of coconut milk. you could totally use coconut milk for a lighter dish. They are toasted coconut flakes- they for sure sell them at Trader joes.